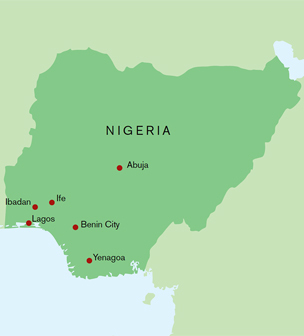 Ife ( pronounced ee-feh) is today regarded as the spiritual heartland of the Yoruba people living in Nigeria, the Republic of Benin and their many descendants around the world. It is rightly regarded as the birthplace of some of the highest achievements of African art and culture, combining technical accomplishment with strong aesthetic appeal. From the 12th to the 15th centuries, Ife flourished as a powerful, cosmopolitan and wealthy city-state in West Africa, in what is now modern Nigeria. It was an influential centre of trade connected to extensive local and long-distance trade networks which enabled the region to prosper. The artists of Ife developed a refined and highly naturalistic sculptural tradition in stone, terracotta, brass and copper and created a style unlike anything in Africa at the time. The technical sophistication of the casting process is matched by the artworks’ enduring beauty. The human figures portray a wide cross-section of Ife society and include depictions of youth and old age, health and disease, suffering and serenity. According to Yoruba myth, Ife was the center of the creation of the world and all mankind. Ife was home to many sacred groves located in the city’s forests. Two groves in particular have revealed numerous sculptures: the Ore Grove with its stone monoliths, human and animal figures and the Iwinrin Grove which is associated with terra-cotta heads and fragments from life-size figures. The identification and function of this head, in common with the others discovered at this site, remain uncertain. Its elaborate beaded headdress, possibly representing a crown, suggest that it was associated with an Ooni, a ruler of Ife. Other sites have revealed spectacular pieces with royal associations, including the only known complete king figure and an exquisite terra-cotta head, possibly portraying a queen both from Ita Yemoo. Today Ife remains a major spiritual and religious centre for the Yoruba people. Some of its shrines and groves are still in use and rituals to key gods are performed regularly. Works of art from Ife have become iconic symbols of regional and national unity, and of pan-African identity. Since Independence in 1960 enthusiasm for copies or reproductions of heritage items with nostalgic associations has increased. The “Ori Olokun” head was chosen as the logo for the All-Africa Games held in Lagos in 1973 and has been adopted as the logo of numerous commercial, educational and financial institutions. Such images have become universal symbols of African heritage. Cite this page as: The British Museum, "Kingdom of Ife: Sculptures from West Africa," in Smarthistory, September 19, 2016, accessed April 21, 2019, https://smarthistory.org/kingdom-of-ife-sculptures-from-west-africa/.